Three things that are not surprising about a conversation with the brilliant actress Lily Tomlin -- One: She laughs. Ever since Tomlin registered on the national consciousness as cast member of Rowan & Martin's Laugh-In, she has charmed audiences with her comedic gifts - her playfulness, her exuberant physicality, her vocal flair. Whether she is speaking through one of a dozen signature characters or in her own voice, Tomlin is surrounded by an aura of mirth. So she is never far from laughter. Two: She becomes other people. Tomlin could have easily made a career as a traditional comedian, telling stories and serving up punchlines as herself; she has the inherent appeal, the easy way with an audience, the knack for telling a story. But she has always been drawn to other people, to their voices, their postures, their attitudes, and she can re-create them in ways that capture a sense of their character. Think of the vast gallery of individuals she has embodied through the years: the homemaker Mrs. Beasley; the child Edith Ann; the operator Ernestine; the revivalist Sister Woman; the philosophical bag lady Trudy; among many others. So when she discusses Bella Abzug, the late congresswoman, she naturally assumes Abzug's vocal character and fortitude. Three: She talks in cosmic terms. Tomlin's material has always had a thoughtful bent; her characters haven't just pondered society's quirks, they've questioned their place in the world, in history; in the Big Scheme of Things. That quality was never more apparent than in The Search for Signs of Intelligent life in the Universe, the play by Jane Wagner that provided Tomlin with a Broadway hit in the Eighties. As is evident from the title, Wagner's script was concerned with a quest for meaning, for purpose, for a sense of place in this grand spectacle of time and space. Where do we fit and what is our connection to all these other people with whom we're shooting across the infinity? The words were Wagner's, but the concerns were shared by Tomlin, as she communicated so vividly in her stage and film performances of the piece. So it's hardly surprising to find issues of The Search still with her a decade later, popping up in conversation with an interviewer. It's no less surprising to hear that Tomlin and Wagner are reviving The Search for a new national tour. With so much of the world suffering from millennial jitters, the play's cosmic scope, rich with wisdom and hope, are more timely than ever. So with a tour stop scheduled for UT's Bass Concert Hall on September 30, Tomlin took a few minutes to talk about connectedness - her connectedness with The Search, with audiences, and with Austin. 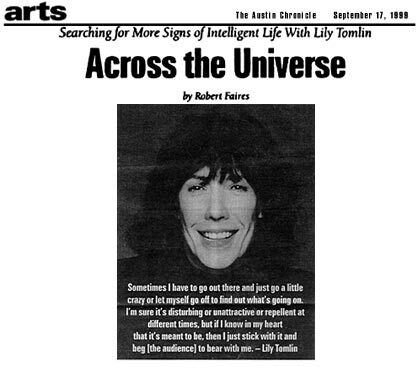 Austin Chronicle: When I first heard about your appearance here, it was billed as Lily Tomlin Live. Lily Tomlin: That's because we were working on a lot of stuff and putting up lots of different things that we've done, and we put up The Search and started to get a whole new spin on The Search, and audiences were real responsive to it. And suddenly The Search seemed so relevant to the end of the century, so we decided to do The Search, which we haven't done in most parts of the country anyway. We got real excited about it and changed the title. AC: It got me thinking about you doing live performance, and I wondered why now? AC: Has live performance changed for you over time? Is it a different experience for you than it was? LT: Well, I think I get better because I get more knowing. I guess I get more experience. I haven't stopped performing live, I do benefits and stuff like that, so I do get up and perform live. But I haven't done a full-out stage performance like The Search in a long time. And you know what it is also? I mean, it's hard for me to talk about it because, of course, I'm gonna perform it, but Jane wrote it, so I can praise her writing, but it's still a little bit awkward. The Search was so impactful with audiences. I mean, it was just one of the most successful non-musical pieces of theatre in years, and I knew that people were truly affected by it. So it's like every generation -- and this is almost a new generation, one that probably has no idea who I am, basically. I look familiar, but it's like Jane Fonda is that exercise person or she's married to Ted Turner and goes to Atlanta Braves games - but anyway, there's so much wonder, there's so much of a kind of magical synergy that happens in the audience when it's done well and the audience is really there for it. I know when I do it myself, that's what I get from it. And I still get that. And I'm getting it even more in a sense. I'm sure that many people would argue that it's probably the best thing I've ever done - maybe not, maybe some people wouldn't, but it feels like one of the best things I've ever done - so at this time in my life, it's like an opportunity to step out with a piece of work that's still terribly relevant and resonant and rich, and the writing is so textured, so I'm excited just to show it to people. AC: Have you had much experience with younger audiences? LT: Yeah, because we've been playing at the universities, and we've had only students basically - I mean, some faculty, but mostly students. A lot of them I'm sure are drama students, so they're probably inclined to this sort of performance anyway, but the writing is high and smart and contentful and perceptive, so anybody who's receptive to that responds to it. AC: But you haven't sensed any generational gap? LT: I haven't really. But as I say, some of the characters are starting to evolve toward the century. Even in doing the feminist piece, the centerpiece of the show with the women who go through the women's movement together. Like I had a woman come-up to me at USC who was about 25, and she said, "God, I identity with that so much because things aren't really that different." She said, "They're different, but they're not that different, and I really didn't have any sense of what went before." And she said, "This has been so inspiring to me." Stuff like that. I mean, so many of the same issues still exist. There have been strides and you see what it was built on. I mean, some young women don't even know who Bella is. I've been listening to a lot of Bella tapes just for inspiration. I've listened to tapes when she was in the Congress, where she's at hearings and stuff. She's so menschy, she's so open. She so comes from the gut and the heart and says what nobody else would really say in the simplest, most direct way. AC: When she was there, you always knew it. LT: Oh yeah. But she's so direct. If you could hear her speaking in contrast to the other people speaking, talking to the CIA or whatever, she's so direct. But she's not uncompromising. She says, "You gotta ask all the questions. You gotta find out. You gotta know." And she said, "Unlike my colleagues, if I thought I couldn't investigate this and make a change in the law, I'd leave the Congress." She said, "I believe that it can happen." She doesn't pull any punches. She doesn't really blame anybody; it's more like that's how the system is and the system needs to really look at itself and be altered in some way to embrace everybody. Anyway, don't get me off on this because [The Search] is not so focused on feminism essentially; it's just that because that happened to be the primary movement of that era, it was kind of an awakening for so many people. The play is really about the connectedness that we have. And I can't think of any time it's more important for people to understand just how much we do impact on one another, from people across the country to people across the table or people across the ocean. Even from a physics point of view, everybody knows, I mean, it's a believed theory that we all derive from the same atoms. In [The Search], Trudy says, "We all timeshare the same atoms." And the wonder and the amazement of that is so great. And to have that experientially, I think, is a kind of renewing thing, I mean, renewing for the audience. That's why I love the theatre, because when I've been in the audience and I've seen something so glorious and so magnificent, you're validated, you're affirmed, you're dignified, you're elevated. One of my favorite quotes about The Search was a critic saying, "We were on our feet applauding our higher selves." We can be as base as the worst possible creature and as high. AC: I know when you come to Austin this time you'll be playing in a much larger hall. Does that affect your ability to relate to the audience? LT: I don't think so. I've been doing a lot of talks and benefits and things to houses that big. I used to marvel at that even in a legitimate house of 1,200 or 1,500 people, because, for instance, sometimes I'm on the stage just speaking. And I would always be amazed at how the emotion and the content carried to everybody, the kind of transcendent experience that comes out of the words, that comes out of the relationship, that comes out of Jane's perception and illumination - it somehow conveys to the audience. I don't know why that works in the theatre. I mean, beyond 50 people, you'd think, "How does everybody get all that?" But for some reason, they do. AC: Well, I would go back to the time-sharing-the-same-atoms theory. I mean, there's something about being in that shared space. Even when it's not literally an enclosure, say when you're watching an outdoor performance, there's still that sense that we've all joined together for those few moments, and no matter how far away you are from the performer, as an audience member, you're connected right up to the front of the stage. LT: Yeah, When it's right, that's so. AC: Now, I have to tell you that I remember seeing you at Lamar University in Beaumont, Texas, back in the mid-Seventies. AC: And there was no seating. Either you or the university had everybody just bring pillows, and we all sat at your feet, and it was a wonderful experience, not just because it was my hometown but because it had a wonderful informality and intimacy that made it even more fulfilling from an audience standpoint. If you had the opportunity to go back to that kind of performance, would it appeal to you? LT: Oh yeah. I mean, that happens in The Search, too, sometimes. I mean, I'm never fearful of breaking the fourth wall or talking to the audience. I certainly don't plan something like that, but when something like that happens, I welcome it because it does make it intimate. It brings everybody to another level of intimacy. Even if your shoe flies off. [Laughs) You know, you'll run into people and they'll say, "Oh, I was there the night your pants ripped. Oh, that was the greatest. What a great night that was." Even though I can appreciate that, I say, "Well, you know that is the easy part. It's the other part that's hard." AC: I've also seen you two times in Austin. LT: Oh, like at Esther's Follies? I've played Esther's Follies because I've done benefits for Ann [Richards]. I've played the Paramount once. What else did I play? AC: I remember you doing a week or two weeks at UT. LT: Oh, you're right, I did. That was when I was doing Appearing Nitely. I made so many friends in Austin. That time I played at UT was one of the best opportunities because I met Ann, I met Ruth Denney at UT. I met so many people. I don't know, it just took. I actually bought lots there on the Pedernales. I sold them last year because I had them since '83 and never did anything with them. I always had this dream that I was going to have this cabin on the Pedernales. So I made some connection with Austin at that time. AC: And you did The Ritz for what I think was a very early version of The Search. LT: Isn't that Esther's Follies? We were working on early monologues for The Search. And it was a fundraiser for Esther's because their building had burned down. AC: Right. Well, it was tremendously exciting because we the audience were picking up on the creative energy you and Jane were bringing to it, trying new stuff, throwing new stuff out there every night. I'm curious about your working process, when you're trying out new material. Where is the audience helpful to you in determining what's working either for you or for Jane and the script? LT: Well, part of it is just that shared thing; it feels like it's working or it feels like they're getting it or it feels like it got too long or it's off the point. But putting it up with the energy and the tension between an audience and a performer is kind of what makes it come alive. So then it has its best shot. Certainly there have been times when I've been working on new stuff, and I believe in it so much even if I'm not performing it well. Even if an audience is not responding to it in some great way, I'll hang in there until I've gotten to the point it least I'm doing it decently to give it its best showing. I remember years ago, when I was working on Agnus, people would say, "Get rid of that kid. I can't stand her," and things like that. Sometimes I have to go out there and just go a little crazy or let myself go off and open to find out kind of what's going on. I'm sure it's disturbing or unattractive or repellent or something at different times, but if I know in my heart that it's meant to be, then I just stick with it and beg them to bear with me. AC: I get to see a lot of new material here every year. This seems to be a great town for playwrights these days, and at least among the local audiences there's a great interest in something being born like that. LT: Yeah, I think audiences love it. AC: However loose it gets, however far you may feel like you as a performer may be needing to take it to give it that best shot, most audiences are right there with you. They want to see the crowning, they want to see the head coming out and the thing being born. LT: I know. One of my favorite things, see, is to hunker down in a place, like we did at the Ritz, and a lot of the same people come every night, or at least frequently, and they see and they affirm that in some way. I remember when we were working on The Search and we were at Santa Fe for about three weeks at a small theatre; it's a small town and there's not so much to do, so people came a lot. And the first night that I did the Kate monologue, where she takes Trudy's umbrella hat, we knew the play was finished, and the audience leapt to its feet, because they'd been watching, watching. The play was really good, it had so much great stuff in it, and then suddenly I'd gone back to the place where we were staying, and Jane had given me this new monologue for Kate where Trudy offers her the umbrella hat. I mean, we'd had that monologue, but it wasn't complete, it wasn't fulfilled yet, and I even said to Jane, "Do you think the audience is gonna believe that Kate takes the umbrella hat?" And they believed it just like that. I mean, it was the moment. You know, we were as high as a kite. Because of the feeling. And I know that a lot of the people there got to experience that crowning, as you say. It's exciting. I yearn for those days. I mean, we used to hit the road like the Joads in The Grapes of Wrath, and we'd leaflet, you know, to try to keep the press away, and we'd just say "Lily working on new material," and you'd have to call a phone number, then you'd have to answer a fan quiz and we'd tell you where it was. You'd have to say, like, what are Mrs. Beasley's children's names? What's Tommy Velour's wife's name and things like that. [Laughs] Because you're just hitting the ground running and trying not to worry about what people are going to say about you or how they're gonna critique it. You just want it to be this live thing between you and the audience. If you're a critic, forgive me. AC: No, no. Unfortunately for so many critics these days, it's about rendering a judgment, not helping the thing live. It's putting a critical stamp on it as if it's a cold object. In fact, you and Jane going back to The Search makes me think of Leaves of Grass, which Walt Whitman just kept doing new things with over and over from the time he first published it to the end of his life. And I think when a stage performer has a truly memorable role that he or she can keep going back to and find new things in, I think that can be a wonderful thing. So, is The Search you're and Jane's Leaves of Grass? LT: We'll see. Who knows? We're certainly, in the middle of our lives.